These Bass Fishing Lures from Buggs Fishing all utilize our own custom jigs heads, designed in conjunction with a professional bass fisherman. These heads were designed to excel in lakes, rivers, and ponds for Largemouth, Smallmouth, and Striped Bass. We use premium black nickel hooks that stands up to the abuse of big bass in all types of cover. These jigs come in various weights for maximum versatility, and can be fished in shallow water to deeper drop-offs. These jigs all feature rabbit strips for superior action, durability, and scent retention. Read on to learn more. We're excited to announce the arrival of the Hydra Bugg Swim Jigs. We think fishing swim jigs is about as exciting as it gets, and we designed this bass fishing lure to excel in all kinds of situations. We start with a custom jig head featuring a 4/0 Mustad Black Nickel Ultrapoint hook and the largest eye to create a trigger point. A weed guard is included, and the line tie is recessed in the head and located on top. 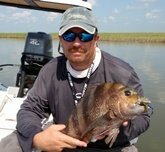 This allows you to fish it near the surface on a level retrieve or deepr with a jigging action. There's nothing like it on the market! There are a lot more features to this jig, and we've created a page to tell you more about it. You'll also learn about rigging a swim jig and when to fish it. Click here to learn more at the Swim Jigs page. 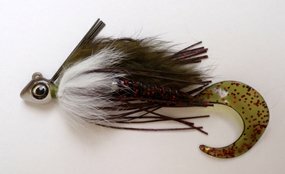 We're proud to announce the arrival of the Buggs Original Bass Jigs! 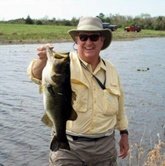 These bass fishing lures are the result of customer feedback, input from an expert, and the Buggs mission. For years we've had bass fishermen admire our Curl-Tail jigs. They'd buy some, go out and catch bass with them, and then lose them when they pitched them into heavy cover. They've always asked us to incorporate a thicker weed guard into the design. I'll have you know that we've been listening! So when it came time to develop these jigs, we consulted an expert on the jig head design. This expert helps design and manufacture our jig heads. He's a Bassmaster Elite Series professional who's been to the top of the mountain and won the Bassmaster Classic. He's also an avid jig fisherman. There's nobody we know of who is better at helping with the design of new bass jigs. And you're probably wondering who this is? Here's the deal. We don't pay him to endorse our products, so I can't trumpet his name. We do pay him to help us design our jigs, and that's a great deal for us and our customers. He designed a jig head with multiple uses, based on our original head design. We started with two sizes, 3/8 oz. and 1/2 oz. Color wise, we started with the most popular two, Black and Green Pumpkin. 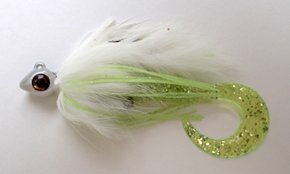 This bass fishing lure is perfect for shallow water cover and several different jigging techniques, including skipping docks, casting, bumping it along the bottom, swimming, and pitching it into cover. But however you work it, be sure to hang on tight! We tie the Buggs Original Bass Jigs with four magnum rabbit strips for maximium action and scent absorbtion. We add a few pieces of flash along each side. Each jig comes with an expertly paired weed guard, stiff enough to avoid snags when you're bringing it through cover but not too stiff where you'll miss a lot of strikes. There's a spike trailer keeper built into the jig for quick installation of your favorite trailer. We recommend double tail grubs or craw-type chunks. The rabbit strips exhibit tremendous action in the water when they're wet. And since you have to get them wet before your first cast, it pays to take advantage of the natural absorbtion of the rabbit strips by soaking them in your favorite scent. Then you'll have a bass fishing lure that looks (and smells) alive in the water! 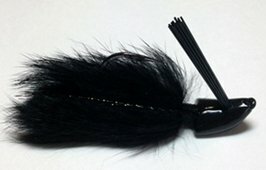 The Buggs Curl-Tail Jig combines the superior action of bunny with a curl tail grub as an accent. These are versatile bass fishing lures you can swim, skip under docks, or bump along the bottom. This flexibility makes it deadly on all types of bass in light cover. We've worked these jigs in lily pads, gaps in mossy banks, drop-offs along rocky banks, rivers, and in flooded timber. These jigs are ready to fish, right out of the package. 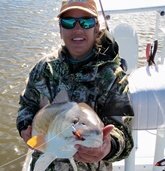 The curl tail grub enhances the action as it flutters like the tail of a baitfish or claws of a crawfish. We've tied a custom screw lock to the hook shank so the tail can be changed out when the fish tear it up. You can also remove the tail and use your favorite trailer. 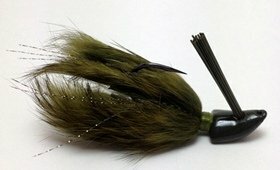 And just like our Original Bass Jig, the rabbit strips we use to tie the Curl-Tail jig need to be wet, soaked all the way through, before your first cast. So why not soak them in your favorite scent? We couldn't agree more. Then you'll have a bass fishing lure that looks (and smells) alive in the water! The 1/8 oz. model can be cast with spinning or baitcast equipment, and Medium Light action will work best. This Bugg and will land softly when sight casting to beds or in shallow water. It will fall more slowly than a soft plastic with an 1/8 oz. bullet weight, making it ideal for use when a slower fall is required. The 1/4 oz. 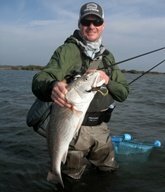 model is the most versatile, working shallow and deeper water and allowing for longer casts when dealing with wind. The 3/8 oz. model will cast a mile, and work deeper water most effectively. All three sizes come rigged with a 3" tail. Head to the Buggs Fishing Online Store.